Maybe a little hippie sounding, maybe new or old to you, but all related to fermentation! It’s quite a fascinating process, relying on just salt and water to make things literally come alive, turning your favorite fruits and vegetables into even healthier and delicious bites. One of the ways it’s different than what we think of as “pickling” is that hot brine or acid (like vinegar) is never used because that kills all of the powerhouse nutrients, and halts any type of good bacteria (like those in yogurt) from growing. Fermentation extends the life of foods, as beneficial bacteria consume the natural sugars and produce lactic and acetic acid for preservation. And they keep your tummy happy, producing vitamins, that help to populate the gut with microbes and boost the immune system. But yikes. This “alive” thing made me a little nervous. The possibility of mold growing and getting sick, the different stages, the process, if the bubbles meant things were going to explode, and wondering if a scoby was an alien from above. Despite the anxiety, I tried fermenting the first time about four years ago, starting with kimchi, and then kombucha, figuring it was just like a science experiment and relying on the resources I could find. Thankfully I stumbled upon Amanda’s inspiring and helpful blog, Phickle, basically an encyclopedia on everything you ever wanted to know about these crazy microbial adventures. 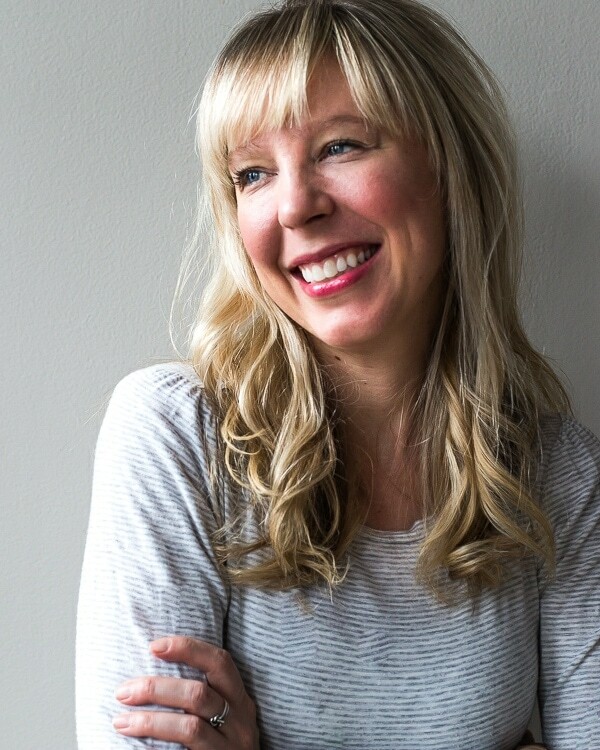 I felt so comfortable following her recipes and tutorials, seriously demystifying the world of fermentation for me. 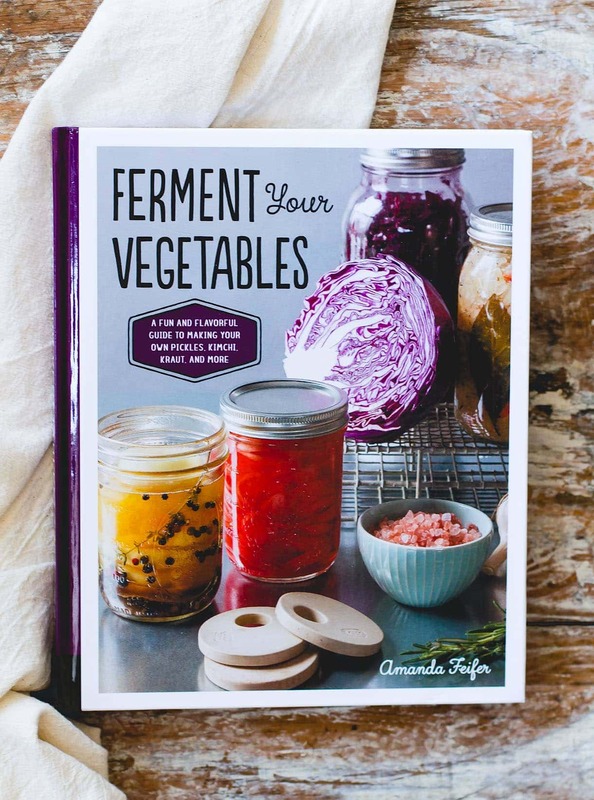 And now she’s written a beautiful book, Ferment Your Vegetables! I got lost in it the days after it landed on my doorstep, between the stunning photos and her practical advice on how to get your own little kitchen bubbling with jars of condiments, kraut, pickles, and even different appetizers (like fermented winter squash hummus!) you can make with the results. 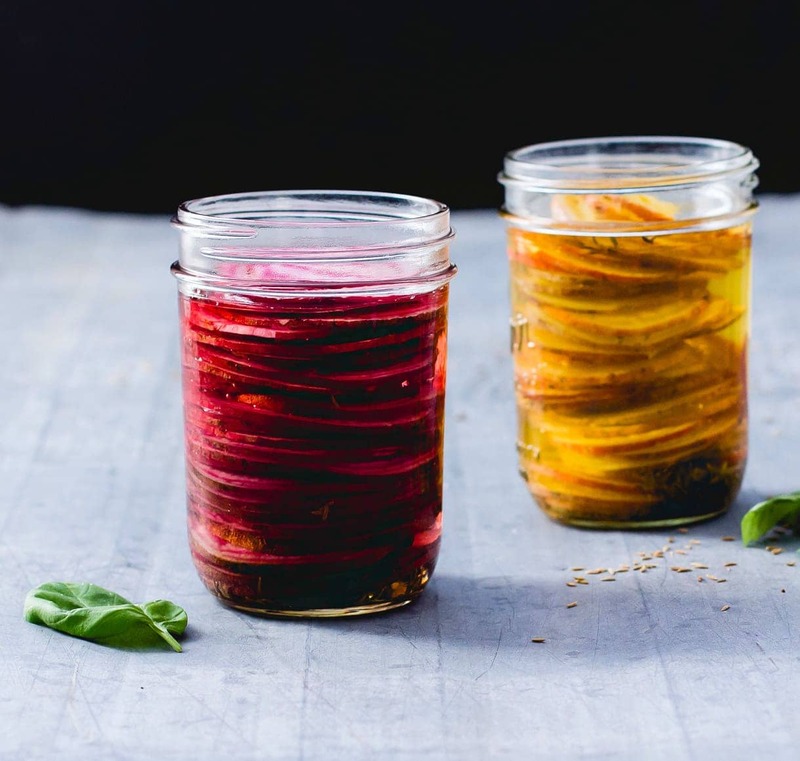 I couldn’t help but make these Fermented Beets with Cumin and Basil first, imagining how beautiful they would shine in the jars, and a flavor combination that just spoke to me. I was dying to try this tangy, earthy, version of one of my favorite vegetables. They turned out incredible. (The 2 pictures right above are the day I started the ferment, the one below this paragraph is after. You can see how their color changes.) Lovingly spiced and a bit sour like a good pickle should be. These colorful babes made me fall in love with beets all over again. 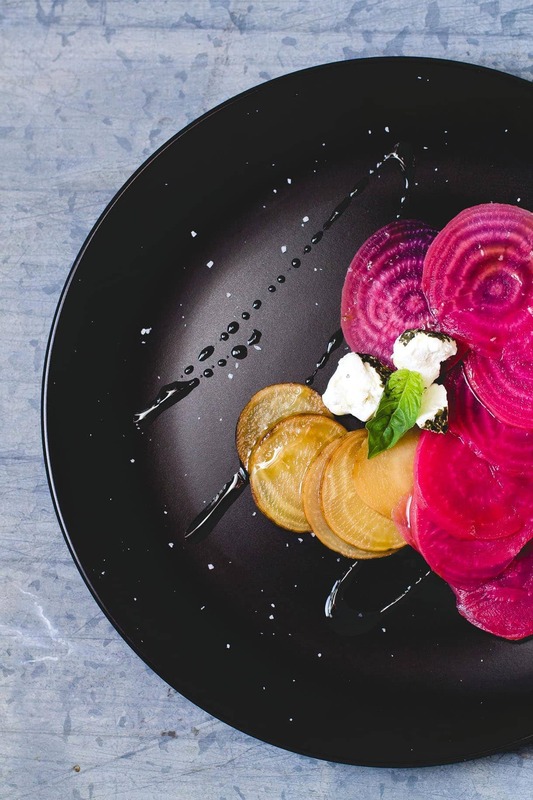 The earthiness of the beets turns into something sweeter and brighter – a true testament of how food can naturally transform into something so different. Not only are they great as snack, but they make a beautiful pickle plate, with goat cheese and a heavy drizzle of olive oil. I’ve also been eating them on salads, diced and stirred into scrambled eggs, and as a topping for juicy cuban pork bowls. Other recipes from the book that are currently sitting on my shelf, bubbling away are: Nutty Sauerkraut (mind blown that you could ferment cabbage + macadamias/pistachos/cashews together! ), Carrot Caraway Turnip Slices, and Garlic Honey. New ways with winter vegetables is on the horizon. Yay for seasonal eating! I think you’ll have a lot of fun trying this out, and definitely adding a unique dimension to your everyday meals. Okay, before you get started, here are some of the most important tips I learned from Amanda that make fermentation so easy and delicious. Make sure you to use washed, very clean glass jars. 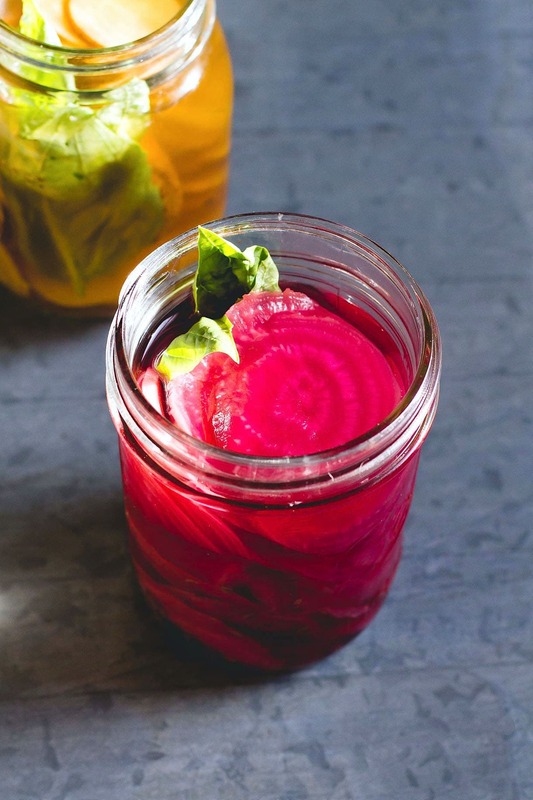 Let your ferments (beets in this case) sit for 7-10 days in a warm spot, around 65-78 degrees F. That is the perfect environment for the bacteria and acid to growing..
You’ll want to make sure the brine sits above the vegetables, using something that submerges them. I used another jar pushed inside the other. And then you MUST cover the jar with a cloth so that bacteria in the air can’t get inside. I learned that the hard way, with one batch that got slimy. Check on them periodically to make sure if the jar has overflowed, you wipe up the spills. If they’re bubbling – that’s a good thing! And if the water is turning a little cloudy, that’s also good. Taste every 3 days or so to see how they taste. When they’re bright, sour, and salty, they’re done. The length of time it takes to get to this stage can differ depending on how warm your environment is. 4 or 5 small beets (1 pound) -- I used chiogga beets, the pink & white ones, and gold beets. Slices the beets into ¼ inch slices. Put the cumin seeds in the bottom of two pint jars and stack the beets on top. Once you're happy with the flavor and acidity, remove the weights and pack basil into each jar. Put lid on and refrigerate. After two days remove the basil (or it will spoil). Enjoy! These will last up to 3 months in the refrigerator. I received this book from Quarto Publishing Group, with no obligation to post. All opinions are my own. This post contains affiliate links, which I make a small amount of money from should you purchase something. I was completely sucked in by the colors of the glorious beet root and they are soooo delicious right now. A perfect time for fermenting or pickling. 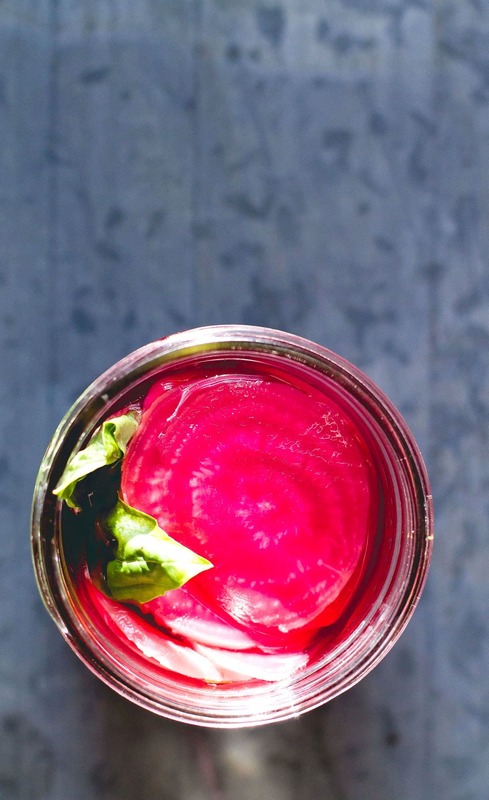 Now, I’ve pickled before and fermented kimchi… but never have I fermented beets! I gotta give this a go. What fun! I’ll check out Amanda’s site. Thank you for this my dear! Looking forward to seeing your sauerkraut! WOW!! Ok, the colors in these photos are crazy pretty! I have always been so timid to try fermenting anything for fear I would do something wrong. It sounds like the book simplifies the process and makes it easy to check yourself. I need to do this! xo. The scientist in me just LOVE kitchen projects like this. Fun, nerdy and totally delicious all at the same time. I love these photos – they are like a breath of fresh air in the middle of winter. I think I’m going to need to pick up this book! 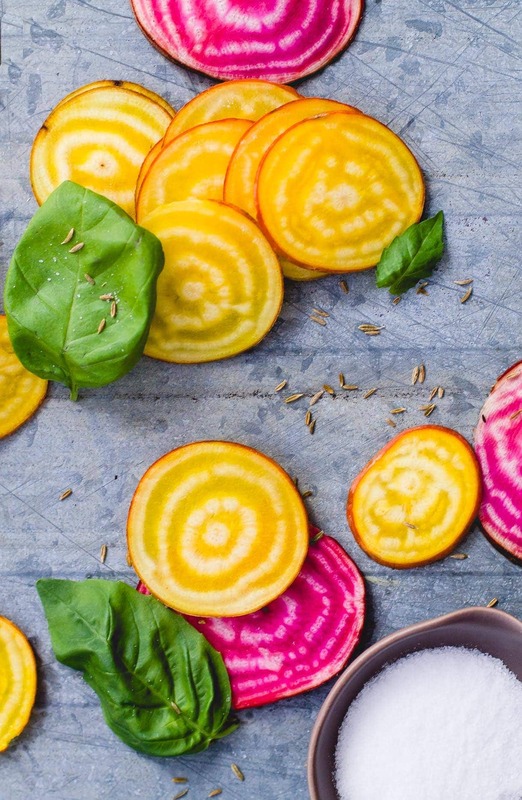 I just love all the beautiful colors that beets have. I can’t believe there are so many cool and different types of beets out there, like those red and white striped ones! I’ve been wanted to ferment and can things for a while but it is one of those things that intimidates me in the kitchen. I really want to make my own sauerkraut! That would be my first thing to do! Maybe I’ll go to the bookstore and sit down and read this book and get some tips. I’m always that weird one on the flour with mountains of books around me. I’m just starting to get into fermenting. I made my own kimchi, and this recipe looks like the perfect next step! 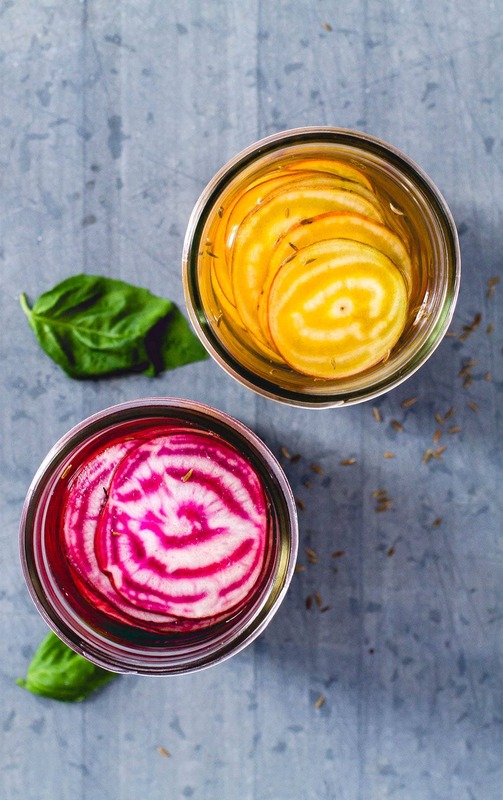 These beets sound wonderfully flavourful and look gorgeous too! awesome work on the kimchi! i think you’d love these pickles. so tasty on tacos! Um, these are the most gorgeous preserved beets I ever did see! thank you Aida! the colors were just so vibrant in the sunlight. 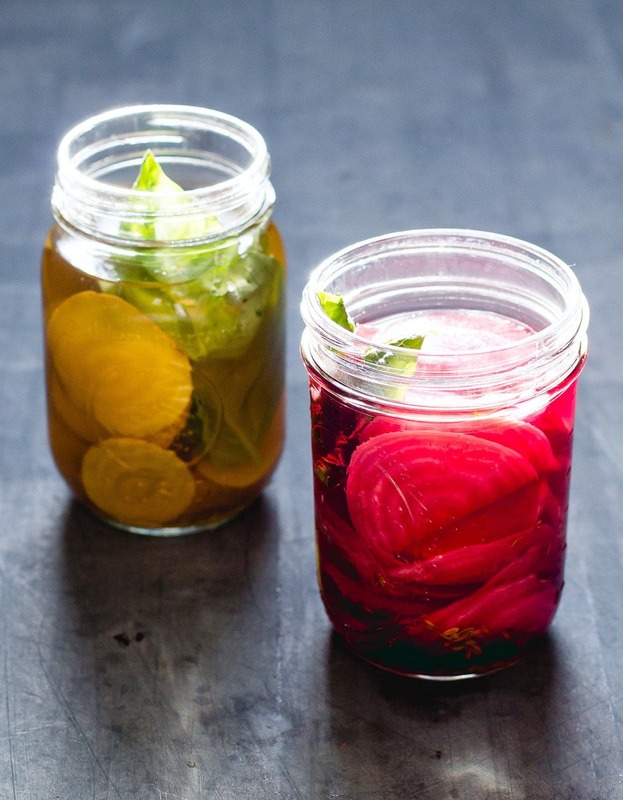 Love these good-for-you beet pickles. My mind is blown too about the nuts. Have to check it out. So gorgeous! I love golden beets and what a fun new way to try them! So gorgeous! Your photos are amazing! I can imagine how wonderful these taste. I also had no idea about the pickling vs. fermenting process. Thanks for the great info and recipe! thanks Patricia! yes, give fermentation a try. it really is a cool process. and i love the pickles! This is so cool! Need to try this! thanks Eden! they’re such a colorful addition to tacos or salads. and yay for good probiotics! Are the beets raw? If so how did you remove the skins? Or did you? Hello! The beets are raw and you leave the skins on. 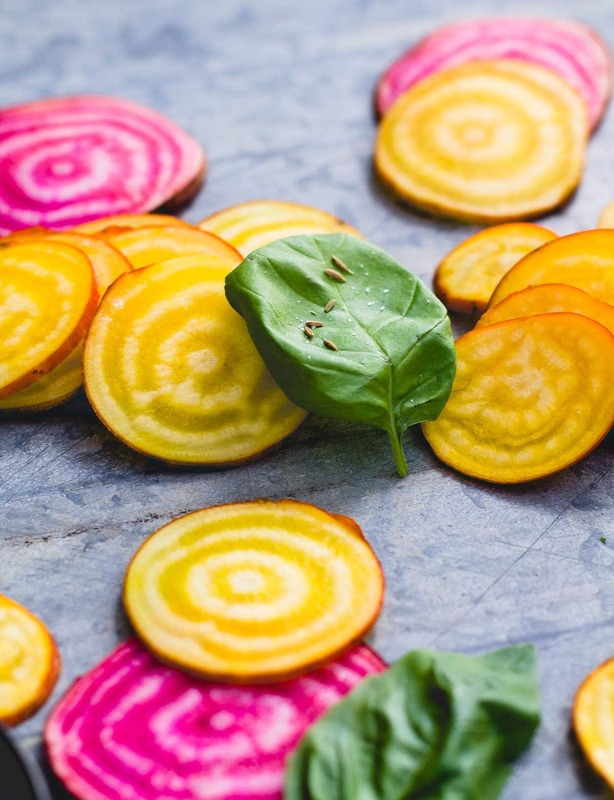 I would LOVE to try this as I love both red beets and basil but I would be terrified that I would give my family food poisoning! If it is fermented, does it contain alcohol? Any reason you could not use a quart jar? you certainly could! just be sure that the beets stay submerged. Thank you for your reply. I am going to make them tonight with excitement. Yes, use a cloth, not a lid. A lid will prevent fermentation from occurring. I left helpful hints about the process in the paragraphs right above the recipe. Hello! This is not a traditional canning recipe. Once they have fully fermented on on your shelf, they’ll last 3-4 months in the refrigerator. would it be ok to use powdered cumin instead of seeds? If you don’t have cumin seeds, I would just leave it out. Does the shape of the pieces matter? I grow mostly lutz beets and slices are too big. Is this the basisod brscht? any shape will work! as long as you use a jar they fit and the liquid covers them completely.